In PISA 2009, the assessment of digital reading literacy was offered as an international option for the first time. The digital reading literacy assessment assessed 15-year-old students’ ability to read, understand and apply digital texts. Australia and eighteen other countries or economies participated in this assessment. 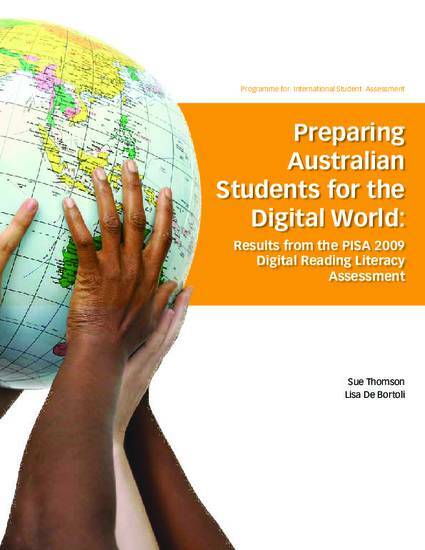 This report presents the results of the PISA digital reading literacy assessment for Australia. It presents the results for Australia as a whole, and where relevant makes comparisons to the other participants in the study. Results are also reported for the Australian states and territories and for different social groups within Australia. Overall, Australian students performed very well in digital reading literacy and had high levels of access to computers and the Internet at home and school. However, this report has identified two major areas for policy attention: The gender gap found in print reading literacy is also evident in digital reading literacy. On average, Australian males performed at a significantly lower level than females. At the same time, male students have stronger skills in digital navigation than female students, which will have negative repercussions in a digital age. Significant differences in digital reading literacy performance have been found in different social groups: those attending government schools; those in remote areas; Indigenous students and students from low socioeconomic backgrounds. These are generally the same groups that are disadvantaged in print reading and other literacy areas, so strategies that are applied to increase students’ understanding more generally need also be applied in this area.